After 47 pages of speculation, lets start with a clean slate for the real thing. No posts until we've seen it! Last edited by Giblet on Wed Feb 01, 2012 2:23 pm, edited 1 time in total. Reason: Changed title to reflect true car name. Just as a heads up, official car threads will be very closely moderated. Please do your best to bring or discuss informative matters about the car, otherwise set up a team thread if there isn't one as of now. 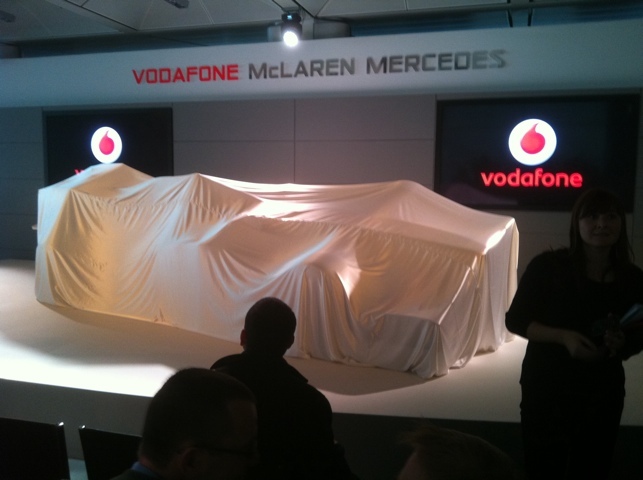 Looking at the #mp427 through the cover, high unstepped nose! How can that be? From Joe Saward, that is the high unstepped nose scarbs just mention. Edit: side pods seem quite cut away, aka red bull. That might just be me though. Somthing infront of sidepods too, may be the seperate side imapct tubes we've heard about on the Ferrari !! Last edited by ledzep4pm on Wed Feb 01, 2012 11:54 am, edited 1 time in total. I don't really see anything fun on it at all, mostly a red herring, or just a tightened up conservative one? Seems the car was equipped with the front wing of the 2009 car, the one it had at the start of that season. Weird buit who knows. I see a couple of very small holes in the top of the body, but not sufficient for exhausts. Can anyone see what's going on with them? anyone have any ideas about the hold in the sidepod. my mistake. its a bulge with a hole in it.